De har brug for hjælp - Sharing International Danmark - støtter vanskeligt stillede enlige mødre, forældreløse og gadebørn i Asien. I’m Đinh Thi Hoa, born in 1981, now a quilter of Nga’s quilt group, Duc Linh district. My family is in the list of poor households of the local authority. We have 5 family members but all costs depend on my small salary from quilting. I have 2 children and an elderly mother. My husband whose health is weak from a liver disease, headaches and a stomach disease, takes medication regularly. Although the medicine he received from health insurance is not working effectively, he still uses it because there is no choice. We have no money to seek treatment at a modern hospital in Ho Chi Minh City. He sometimes feels strong and he can do farming on the rice field. Fortunately I have had my quilting job since 2001. Although my income is not much - average 2 million VND per month (approx EUR 73), I'm very happy because it covers most of our expenses and it is the main source of income in our family. I have wished that if I had enough money, I would take my husband for a diagnosis and treatment at Ho Chi Minh City in order that his health could improve and he would be able to help me earn more income for the family. Tran Thi Phuong was born in 1977, and has 4 children. Her family has a very difficult situation: The eldest son who had mild mental illness could not go to school and is now living at his uncle’ s home. 3 smaller children also have health problems - one with a heart disease, and one with malnutrition. Her husband, Tran Van Thanh, got tuberculosis 10 years ago, but because the family is too poor to obtain proper treatment, he now weighs only 33kg and his disease has become drug resistant. He is unable to any earn any income, but whenever he gets a little money he has treatment at the hospital. When they run out of money he stays at home. His family has no cultivated land, and the burden of supporting the family has been put on Phuong’s shoulders. She works many different jobs to earn money such as bottles and plastic purchasing, brick making, pig raising, etc. However, her weak health has prevented her from making bricks too much. In spite of the difficult family situation, she could not let the children leave school. But how does she manage the school expenses and still have enough for food? They often have no rice or food to eat and must borrow from their neighbor. Her biggest concern is how to help her husband improve his health? How to help her children continue their studies? And how to prevent herself and children from contracting the contagious tuberculosis from her husband, their father! Currently Thien Chi project site has asked Dr. Le Ba Quang from An Sinh Hospital at HCMC to help Phuong’s husband’s with treatment. Residential treatment in HCMC requires long term relocation which is very costly for the patient and family. With their current economic situation, the family cannot afford to treat the disease. Due to the contagious and high spreading nature of this disease in the community, and especially for Phuong and her children, Thien Chi is trying to seek funds to help this family. We are currently supporting the family with a micro loan of 2 million VND to raise pigs to assist in increasing their income. But what this family needs, is help in the treatment of Thanh’s disease, limiting the spread of the disease in his family and throughout the community. 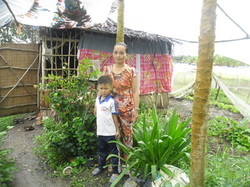 In a small house made from tree leaves and branches - approx 12m2, there is an energetic woman who looks emaciated, and a small boy - Mrs Dang and her son. Her house is located in Binh An hamlet, Long Binh commune, Hau Giang province. She has a difficult family life. Her husband has a disease and has lost his ability to work. The cost of treatment for his disease if approx VND 80M (EUR 2925) and this is a huge costs for her family. It breaks her heart to see her husband in so much pain. She is now has the burden of supporting the whole family on her shoulders. They have 2 sons, the eldest in grade 4 and the youngest in kindergarten. Anh Duong has provided Mrs Dang with work in one of the quilt making groups, and also provided a scholarship support for her eldest son attending school. 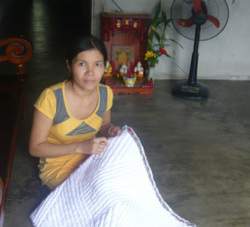 At present, Mrs Dang's salary in the quilt group is approx VND 2M (EUR 73) per month. She said “this is the best work for me now. It helps me earn money for my family while I can also take care of all members in my family! Mrs Don was born in 1970. She has 2 children: One is in grade 7 and the other is in grade 5. She is now living with her mother after a long time of being beaten and mistreated by her husband and his family. They have always beaten and insulted her because of her poor health and the fact that she couldn’t earn a lot of money for them. Her mother is old and always sick, so Mrs Don’s has to work to earn money to take care of her mother and herself. 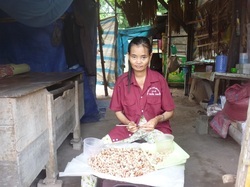 Every day, she goes to the company to get 3 kgs of cashew nuts to split open in her home. On average, she earns 18.000 VND/kg (€0.6). When Thien Chi’s staff visited her, we saw that she also has a problem with her health, so we invited her to join our health training group with topics on women’s gynaecology. Throughout this training, we found that Mrs. Don has had a menstrual problem for months, but she didn’t have enough money to obtain a diagnosis and treatment in the hospital. On 25 May, 2013, Thien Chi centre supported a group of poor women to go to Từ Dzu hospital in Ho Chi Minh City for diagnosis, including Mrs. Don. After the medical examination, the doctor asked that Mrs. Don to be admitted to hospital urgently because she has a right ovarian cyst, uterine tumors and severe anemia due to hemorrhaging which has lasted for such a long time. Her condition is life threatening and needs to be treated immediately. Finding the money for this treatment if now her biggest worry! Tu has been married twice but is now single and living with her 4 children in a 30m2 house. She got a divorce from her first husband as they were no longer happy. She has alone brought up their 2 children without any allowance from their father. Her second husband who was a running away from the authorities was arrested after her youngest child was born. All of the burden of supporting her family has now been placed entirely on her shoulders. Despite many hardships, she always tries her best to let her children continue at school. Her eldest child is studying in grade 8, and the youngest one is in kindergarten. She works as a casual dragon fruit worker whenever she can find work. 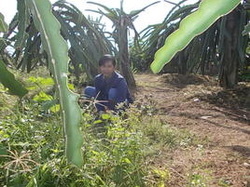 Her parents provided her with 200 new dragon fruit trees, but as a result of her needing to find work elsewhere, she has not been able to take good care of her trees and they have become stunted. When asked about what she wished for in life, she said "I only wish for good health to allow me to continue to seek more work and that my eldest child has a bicycle to go to school. He has to walk a long distance of 5 – 6 km or he has to ask his friend for a lift everyday". There is nothing valuable but an old TV for entertainment in Thom’s corrugated iron roof and mud floor house. This house shelters Thom and her 2 small kids aged 1 and 3yrs. Her husband died of liver cancer when she was five months pregnant. How painful it was for her! The baby was born without knowing his father by sight. After Thom's husband died, her younger sister (23 yrs old) moved from her home town to live with Thom and her children to help them survive. Currently, the lives of Thom and her children depend on the low wage of her younger sister’s casual job. Unfortunately, her sister has now contracted a heart disease but doesn’t go to hospital for her health checks because she is afraid of not being able to afford the costly ongoing disease treatment. Thom is looking after the kids at home, and whenever they sleep, she takes care of her 100 dragon fruit trees – the last assets from her late husband. She said that when her kids are older, she will raise chickens to earn more money. 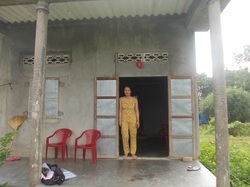 Thien Chi center will support her with no interest loans and raising livestock technique training . She also hopes to have more money to fix the house, cement the floor for her children so they have a clean place to play while she is taking care of chickens and the dragon fruit garden. Tinh's house is located at the end of a long track surrounded by luxurious vegetation. She and her 2 children are living with her 61yrs old mother who has a mental illness. When the mother is ill, she usually scolds and kicks Tinh out of the house. She didn't get married but used to live with a partner who left her after having 2 children. She is now taking care of her children aged 13 and 5 yrs and her mother by herself. 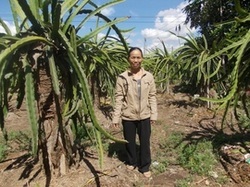 She has planted 300 dragon fruit trees but they have not been harvested yet. Every day she works casual jobs at other dragon fruit gardens to earn money to support her family. The day when we visited her, the youngest child was in hospital due to a digestive disorder. Tinh's tears rolled down her cheeks as she thought of her child in hospital and of her old mother always scolding and kicking her out of the house. How unfortunate her situation is! Phuong's husband – previously the breadwinner in the family was a casual construction worker until he recently had an accident at work. He has been hospitalized for 2 weeks for the treatment of a ruptured tendon in his hand which had heavy bleeding. 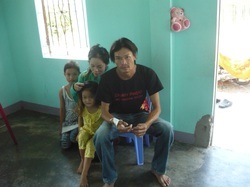 Every day Phuong and their 2 children have to look after him in hospital. When his health is better, doctors have prescribed 2 months’ rest in order that the wound is completely healed. Total cost of this treatment is nearly VND 10 million (EUR 367). She has to take care of her husband and also work casual jobs as an assistant construction worker. Her wage is too low to manage all the expenses including the high medical fees. Their 2 children are studying in grades 4 and 1. They are very studious but are at risk of leaving school due to the difficult family situation. There is nothing valuable but a small house with enough cultivated land to plant 100 dragon fruit trees which they have had since they were married. The household income is not stable due to the casual employment and now the burden to support her family rests entirely on her shoulders. How will their lives be? The anxiety of money worries, the children’s education, and the health of her husband is appearing in her exhausted eyes. After divorcing with her husband, Mrs Tu and her son (8 years ole) have to come back to her parents’ family to live. Her husband has never provided money for her to take care of their son. Her parents’ house is also poor and have a lot of members, so she and her son have to cook by themselves. Her son is now in grade 3. 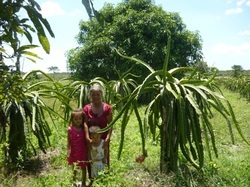 Every day, after bringing her son to go to school, Mrs Tu works casual jobs at other dragon fruit gardens to earn money. Thank for savings, after a time she could buy a rod of land to grow 100 dragon trees by herself. 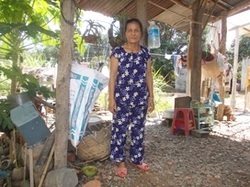 In 2010, by seeing her difficulty, Ham Minh’s village worker contacted with Thien Chi centre to come to survey and after that provided Mrs Tu with interest free loan of 1.500.000 VND (EUR 55) in order to help her buy compost for dragon trees. At the same time, we also invited her to join in agriculture training to learn more technique of growing dragon trees. Her dream is now to have enough money to build a house for her and her son for living because her parents’ house is small and has a lot of people. But this dream look far for her when she has no a stable job. We just only wish she has a good health to reach her dream! Mrs Hoa was born in 1963. Her husband died more than 10 years ago, but she decided not to remarry although she was young at that time and a lot of men wanted to get married with her. She wants to spend all her time to work and take care of her son. Her son is now the students at the college. After her husband died, she brought her son come back to her parents for living because she and her husband didn’t have the private house. After 4 years, her parents gave her a small land which was enough to build a small house with the support more by the local authority and neighbors. She has only job when other households hire her to take care of their dragon trees. In 2011, Thiện Chí’s staff invited her to join in training course on techniques to raise chicken. After that, she applied for Thien Chi to get microloan to raise chicken. However, because she didn’t have land to build the chicken coop, so she had to borrow coop of her sister for raising chickens. Current income of her family is only €17/person/month. Despite her difficult circumstance, she is happy because her son learns well and very grateful to her. She wished that she has enough health to working until her children finish his learning. After a long battle with the severe hypertension, Hoa's husband died in 2012. It took a long time for her to regain spirit after his death. She has worked very hard to earn money to support her 4 children and grandchildren. Her eldest daughter divorced her husband and returned with a grandchild to live in her mother’s house. The 2 middle children have left school and are working as casual workers while the youngest child is still studying in grade 11. Hoa is currently staying at home to take care of 300 dragon fruit trees and she has also received a microloan and training from Thien Chi to raise 2 pigs. At the same time, she has to look after her grandchild while her daughter goes to work as a casual dragon fruit worker. Hoa’s health is not good. She has severe arthritis whenever the weather changes which makes her joints painful and she is unable to do anything. The desire of better health is the most important thing now so she can continue to look after her grandchild and support her youngest child to continue his education. 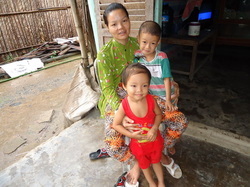 Like many other women, Huong dreamt of a happy life with her husband and good children by her side. However this dream was shattered when her husband left her to follow another woman regardless of his 2 small children. Huong has severe goiter – a type of malignant tumor and she goes to the hospital regularly for checks and medication. Life became even more difficult when her 13 yr old daughter was diagnosed with haemophilia. There is just not enough money to afford the costly ongoing disease treatment. In spite of her sickness, the girl is still trying to go to school regularly. Despite her hardship, Huong is trying her best to work to raise money to support the family and purchase medication for both herself and her daughter. Her parents are living nearby, but they are also very poor and cannot help her with anything. Fortunately, the local authority supported her to rebuild their house in order that she and her children have a better shelter to live in. In addition to working as a casual dragon fruit worker, she has also received a microloan and training from Thien Chi to raise 50 chickens to generate extra income. Now she just wishes for better health for both herself and her daughter, so they can live happily together. Anh got a divorce from her first husband and their daughter is now 16 yrs old. She remained and had another daughter who is now 12 yrs old. Her second husband, who already had 4 children, died of cirrhosis of the liver three years ago. 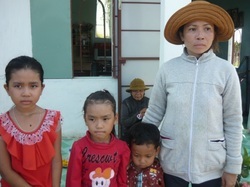 After his death, because Anh didn’t want to haggle with the 4 stepchildren for the land and house, she had to return with her 2 children to live at her father’s house. Currently, they are living in a small compartment which her stepmother always wants to regain. Every day Anh sells sugarcane juice in the market with an income of approx 80,000 VND/ day (EUR 3). With the help of a microloan and training from Thien Chi, she is also raising 40 chickens to sell. This will help to raise enough money to take care of her children. Her eldest daughter left school at grade 10 and the youngest one is studying in grade 6. She hopes to have enough money to provide a separate home for them in the near future. Ms. Do Thi Tim living in Hamlet 3, Vinh Vien commune, Long My district was a poor family in this area. Her husband has left the family many years ago when she was pregnant. She and her daughter live in the isolated area of rice field so there is no electricity in her house. 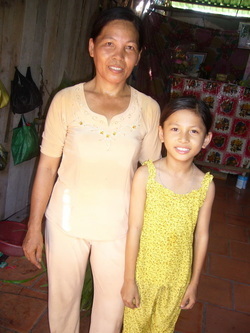 Her daughter, Do Thi Hong Tuoi is studying at 6 grade in the school far away from her house. Last school year, she has got certificate of satisfactory progress in her learning. The project has been assisting her to implement vegetable model by giving free-interest loan. The project is currently encouraging her to do more agriculture models in her little land for increasing income. Ms.Nguyen Thi Khoa lives in hamlet 5, Thuan Hoa commune, Long My district. She is 36 years old and has two husbands in her life. She used to be beaten by the two husbands and now two of them have gone away. She has 2 sons, the older boy is studying at fourth grade and the young boy is studying at second grade. 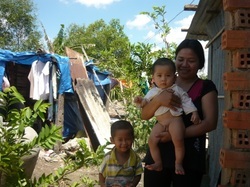 She and her children are living in the dilapidated house next to the land of her parent. She does not have any land so she has to live in her parent’s land. Every morning, she usually makes the sticky rice and fried banana cakes to sell on her bicycle around the neighbors. The project tried to help her by providing loan to raise pig for income increase. The project also tried to enhance her capacity by providing training on pig raising technique and women right against domestic violence. 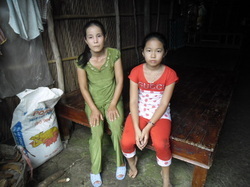 Ms.Le Thi Thuy Dung living in Phuong An hamlet, Phuong Binh commune, Phung Hiep district is a very poor in this commune. Five years ago, her husband has gone away when he knew that his wife had a serious disease about dermatology and venerology. The doctor in Can Tho hospital said that she had to pay a lot of money to cure the disease but she is very poor. 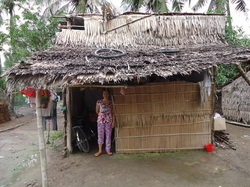 Even her thatched house was collapsed in three years ago and she could not afford to build it again. Now she and her daughter are living with her mother. Her little income from growing vegetable is not enough for her daughter’s learning and she has to suffer the disease a long time without treatment. Ms. Võ Thị Sện, 51 years old, lives in hamlet 9, Vĩnh Viễn A commune that is the most isolated commune in Long My district, Hau Giang province. Her husband died in the traffic accident in 2008 and she had to raise two children alone. She did not have any land to implement agriculture model to have stable income. So every day she has to make the rice cakes to sell in the commune market. Her income is about 30.000-40.000 VND/day (1.2 Euro/day). Her house was broken in last rainy season and she moved to live with her son in law. 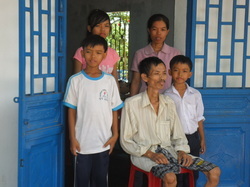 Her young son, Nguyen Hoang Ninh is now studying at ten grades in the school far away from his house. He is a good student who would like to enter university. 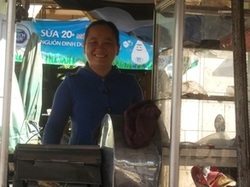 Now she participates in the micro credit program of Anh Duong to do small business. She wishes she can afford her son to attend university for having better life. Ms.Pham Thi Hoa, 41 years old, lives in Phuong An hamlet, Phuong Binh commune, Phung Hiep district. Her husband left the family after she just gave birth three month. Her house locates in the remote area so she has many difficulties in traveling to schools and market. The main transport of her family is her old boat and there is no road to access her house. She has 1.000 square meter of rice field so Anh Duong center has supported her to implement the pilot rice-fish model. 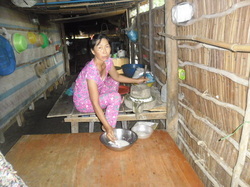 Besides supporting loan, Anh Duong also supports rice seed, fish, technical trainings to her family. Her daughter now is learning at third grade and she is a good pupil. Ms.Truong Thi My Le, 48 years old, lives in hamlet 4, Xa Phien commune, Long My district. Her husband left her when she was pregnant in seven years ago. She had to raise two children alone by selling her daily labor for the neighbors and planting vegetables in a little land next to her house. At present, her old daughter got married and lives with her husband far away. Her son is studying in the second grade, and he has walk far to school. The project has supported her family a free interest loan to grow vegetable in the net. Profit from growing vegetable is not enough for their lives so she wishes to have more capital to implement a mushroom model for increasing income. Her leaf house is going to fall down if there is any storm or heavy rain. Ms. Le Ngoc Tho was born in 1987 living in hamlet 5, Thuan Hoa commune, Long My district. She has 2 young children. The old boy is going to attend first grade in this school year and the young gird is 3 years old. From her husband left, she was so hard to raise the two young children. She had to sell her day labor for the neighbors. All daytime, she stays in rice field to cut rice to earn income but it is not sufficient for their lives. Anh Duong center has been assisting her to raise pigs for economic development. Besides, the center also trains her about pig raising technique and gynecological disease preventions.